California investigators have said a car that plunged off a roadside cliff, killing a family of eight, may have been done deliberately. California Highway Patrol (CHP) say the car’s software data and a lack of skidmarks or evidence of braking indicates it was “intentional”. Bodies of five family members have been recovered. Authorities say the three other children are presumed dead. State child protective services had recently opened a case on the family. Captain Greg Baarts of the CHP Northern Division said on Sunday night that information pulled from the vehicle’s computer shows they had stopped at a scenic pull-off on the side of the road before accelerating about 75ft (22m) across the dirt and directly over the cliff. “Preliminary investigation indicates to us that this incident might have been an intentional act and not the result of a traffic collision,” Captain Baarts said. 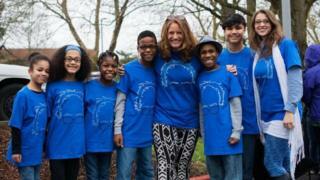 Parents Sarah and Jennifer Hart and three of their adopted children – 19-year-old Markis, 14-year-old Jeremiah and 14-year-old Abigail – were confirmed dead on Wednesday by authorities in Mendocino County after a passerby spotted their car at the bottom of the cliff overlooking the Pacific Ocean. “It was pure acceleration from last brake application until it hit the bottom of the ocean – the edge of the ocean,” Captain Baarts said, adding that no suicide note has been discovered. Devonte, 15, Hannah, 16, and 12-year-old Sierra are still missing, but presumed dead. Authorities say the missing children may have been washed out to sea. “This specific location is very difficult to search because the ocean currents and tides are strong, it’s unpredictable, and the murkiness of the water makes it difficult to see,” Captain Greg Van Patten of the Medocino County Sheriff’s office told the Associated Press (AP) news agency. The vehicle was discovered on 26 March, three days after child protective services in Washington state – where the family lived – opened an investigation. The family’s neighbours filed a complaint that the children were being deprived of food. Neighbours Bruce and Dana DeKalb complained to authorities that 15-year-old Devonte had told them that his parents were “punishing them by withholding food”. Devonte rose to national attention when a photo of him hugging a police officer at a protest against police brutality went viral in 2014. The boy, who like his siblings was being home-schooled, had asked that the couple leave food in a box by a fence for him, the couple told CBS News. In 2011, Sarah Hart pleaded guilty to domestic assault in Minnesota, where the family was living at the time. She told investigators that “she let her anger get out of control” while spanking her six-year-old adopted daughter, court records show. Family friends disputed that the parents were abusive. The six adopted children came from “hard backgrounds”, family friend Max Ribner said. “They transformed these kids lives,” he told US media. Zippy Lomax, a photographer who knew the Harts, called it “a tragic accident of a magnitude that cannot be measured”.